One of the main words that comes to mind when I think about these girls is surprise. From the beginning, surprise; from the first ultrasound, surprise; from the ultrasound that revealed their gender, surprise; from their early delivery, surprise. 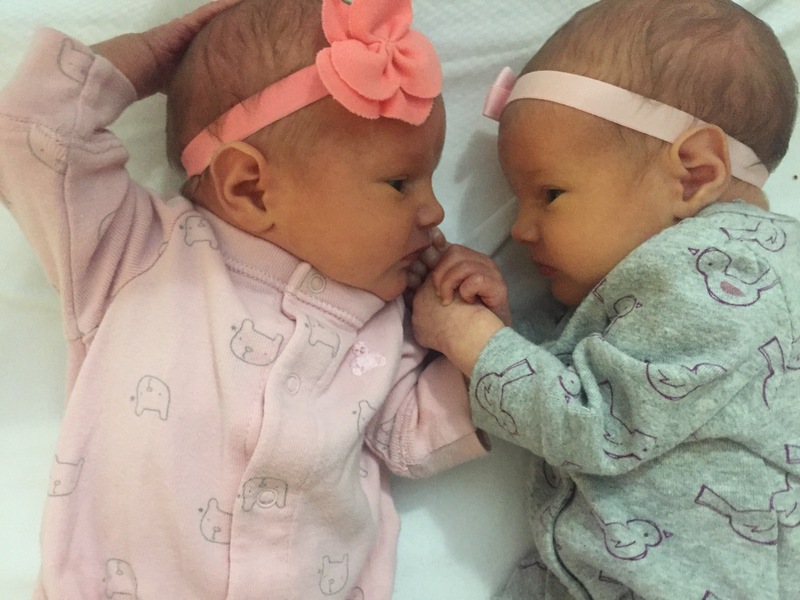 I wasn’t fully expecting to get pregnant when I did, or for the one baby to end up being two, or for them to be girls, or to deliver at almost 35 weeks with just minutes notice. Yet here we are! The pregnancy surprised me by how physically demanding it was. The first few months stretched me beyond what I thought I was capable of handling. The months of September to November are mostly a blur now, but what I remember is needing three naps, in between changing diapers and refilling waters and giving food and occasionally reading a book–just to make it through the day. I remember endless episodes of Chuggington; I can’t listen to the theme song without thinking about laying in bed hoping that if I fell asleep I could feel relief from the sickness. I remember spending my days feeling on the very edge of barfing, and chewing packs and packs of mint gum so I could keep food down. The nausea came the worst at night–raging from about 4pm until almost midnight. Not to mention the rest of the pregnancy. And then, there have been so many good suprises: cooked meal, a spontaneous adventures with my kids so I could rest, encouraging texts and calls, and COUNTLESS other examples of abundant generosity, both from my dear family and friends as well as from kind acquaintances. Then came Wednesday April 19, the day I went in to the hospital for a steroid shot at the recommendation of my doctor (common for twin pregnancies to help lungs develop quicker in case of early delivery) and in a couple hours discovered I would not be leaving the hospital until the babies were born. I was 34 weeks and 4 days, when I was hoping to make it until 36 weeks. I held onto hope for making it just one more week (surely I could endure the extreme discomfort and pain in this hospital bed where I couldn’t really move, for one more week? ), just a few more days, just one more day, just until after the next steroid shot in a couple of hours??? And, just like that, it was over. Surprise! We survived it, I told Joey just minutes after. He knew I didn’t mean the surgery, but the pregnancy. It was over, and just beginning. And the surprises just keep on coming. Surprised by a week-long NICU stay–and surprised by the hidden blessings that came from it. Surprised by my smooth recovery, in stark contrast to my vaginal birth recoveries. Surprised by how happy and peaceful and somehow energized I have felt. Surprised by how natural it all feels right now. Where I expected to experience chaos, I have felt peace. Where I expected to experience exhaustion and overwhelm, I have felt energy and focus and joy. The words we’ve prayed over 2017 are open hands. These open hands have given much and received much thus far. I’ll keep these hands open; I wager these little ladies hold more surprises for our family in the future. It’s all His grace. What a beautiful mantra to pray. You’ve been so strong and I’m intensely graceful for the peace you are experiencing now!